If you're just starting your living room flooring adventure, be sure to explore the most common types of floor coverings in depth. Carpet is the most demanded flooring product on the market. It is known as the most popular choice and is sure to make your living room comfortable and cozy. Carpeting comes in many colors and styles, so there is an option for any occasion. 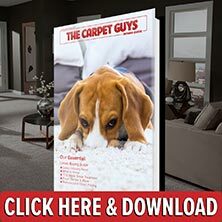 You can check out some of our best carpet for sale online or right in your home. Natural hardwood is the crème of the crop in the flooring industry. There is a wide variety of colors and species to choose from, all guaranteed to make your living room shine luxuriously. Hardwood flooring performs best in living rooms, bedrooms, and areas where water and moisture won't be a problem. Laminate flooring is another great choice for living rooms. It's not all natural wood, but it mimcs it almost completely and will last longer in high traffic areas. Laminate floors look great and provide a stronger durability that natural hardwood will. Vinyl flooring works well in any room of the home including living rooms. It can offer the look and feel of wood or stone at a fraction of the price. Not only is vinyl flooring durable in any setting, it's also easy to clean. For anyone wanting a tile look, it makes the best floor tiles for a living room hands down. With so many type, style and color options to choose from, flooring for your living room depends on your ideas and decor. Selecting a floor covering for your living room is made easier when you choose The Carpet Guys. We bring the flooring right to your living room. Whether it is laminate, hardwood or living room carpet, you can see it all right in your home. If you have made a decision on what flooring you would like in your living room, it is time to call the professionals. Our installation crews specialize in all kinds of flooring, and we guarantee your floors will perform better than you can imagine. To get your living room flooring installed today, book a free in-home estimate with us. We carry many different types of flooring, waiting to be installed in your home.